The Variable Slalom tests the ability of robots to drive through a space that is set to slightly more than the width of the robot. The apparatus consists of two wall segments, attached together with a block of wood. Depending on the use it may be necessary to screw or velcro the walls in place, either to the floor (via the block of wood) or via the walls. (A) 2x 15 x 300 x 300 mm (12 x 12 in) OSB sheet. 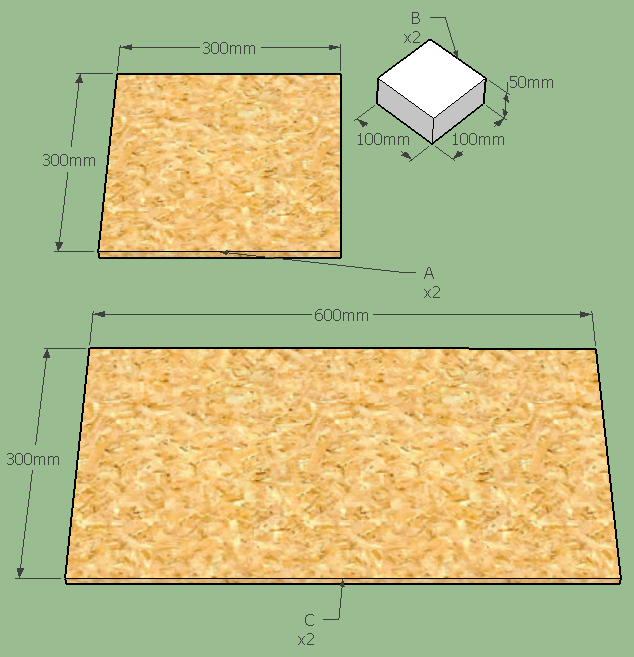 (B) 2x 50 x 100 x 100 mm wooden block (approx). (C) 2x 15 x 300 x 600 mm (12 x 24 in) OSB sheet. (not shown) 2x 100 x 100 mm velcro hook and loop.